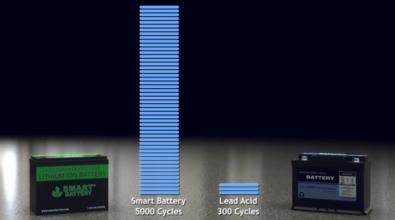 SMART BATTERY® | A DROP IN REPLACEMENT FROM LEAD ACID BATTERIES. 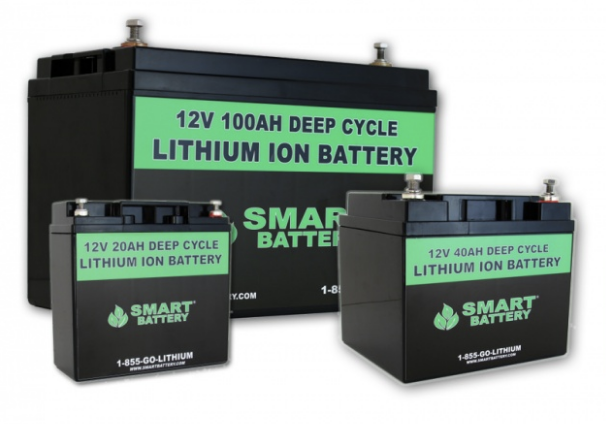 Smart Battery® marine lithium batteries are the industry's predominant choice for dual purpose - starting and deep cycle lithium marine batteries. Our batteries require Zero Maintenance are Plug & Play and come with a Limited Lifetime Warranty. With a life of 3000 - 5000 cycles, Smart Battery Marine Lithium Batteries can last 15 times longer than Lead Acid, Gel or AGM Batteries and are designed for use in all Marine Applications from Commercial Vessels, Yachts and Cruise Ships to Fishing Boats, Electric Propulsion and Trolling Motor marine applications. Need it fast? 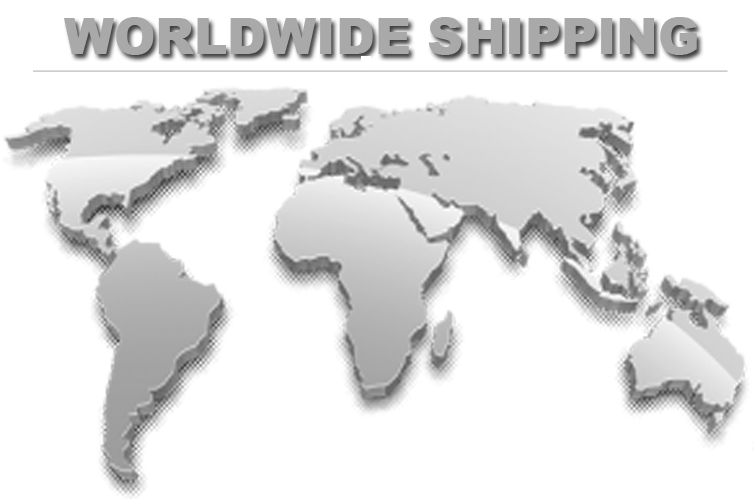 Same day shipping available on in stock items ordered before 2pm EST. Group 24 - 25 lbs. Group 27 - 28 lbs. Group 31 - 30 lbs. Group 8D - 72 lbs. Group 8D - 95 lbs. Simply Connect your battery cables and you're ready to go. Every Smart Battery has a built in battery protection system keeping it running at peak performance for thousands of cycles. Smart Battery lithium ion batteries can be connected in series or in parallel. Our internal battery protection system requires zero maintenance for the life of the battery. Every Smart Battery® comes with a built in Battery Protection System (BPS) that optimizes the cells and provides maximum safety and dependability at sea. Yachts with large battery banks can typically reduce 70% of their weight and use around 1/3 of the space required for the same amount of power as their lead bank. Safely use 100% DOD (depth of discharge) meaning you can expect to nearly double your capacity when comparing to the same size lead acid, gel or AGM battery. Our lithium batteries will provide you with 100% depth of discharge for over 2000 cycles. After 2000 cycles, the battery will still have 80% of its rated capacity. View our full line of 12V Lithium Batteries. 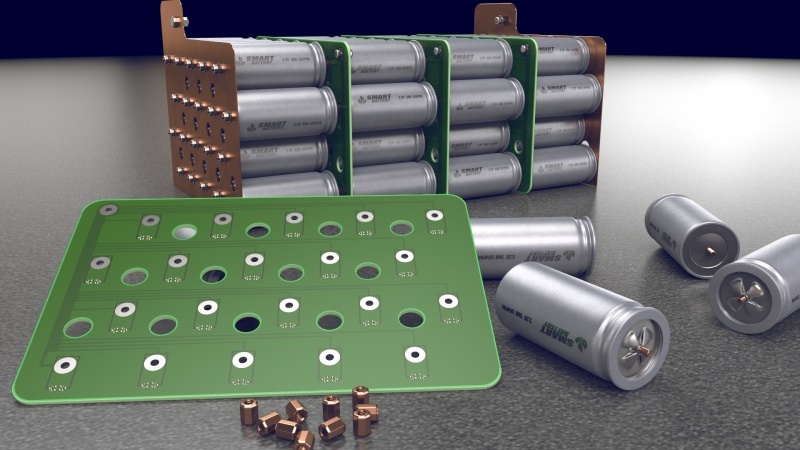 Smart Battery offers a wide range of 12V Lithium batteries that can be combined in series or in parallel. We offer chargers from the industries leading charger manufacturers. Smart Battery® Lithium Ion Battery Chargers are programmed specifically for our batteries. Smart Battery's work with all 12V, 24V, and 36V trolling Motors and offer the greatest flexibility as a dual purpose battery for deep cycle and starting. Our lithium batteries hold above 13 volts for your trolling motor giving it the power it needs to keep running at its highest thrust throughout the entire day. In contrast lead batteries, their initial voltage starts at 12.8V and quickly go down to 11V in in strong current or winds. This causes your motor to run slower when you need power the most. 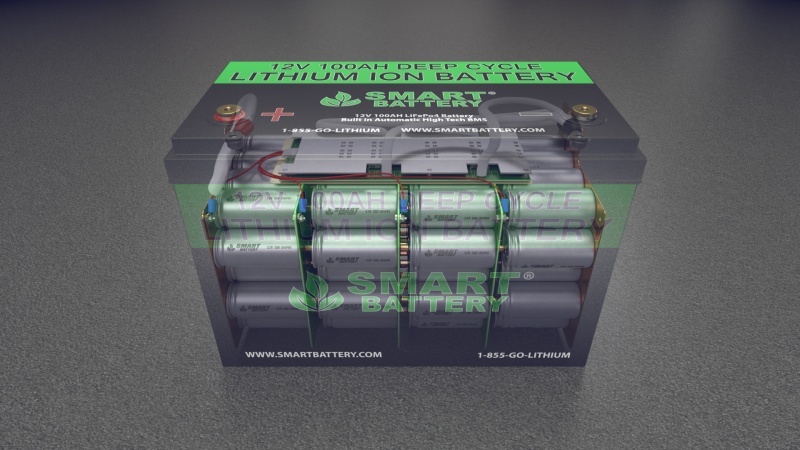 Smart Battery uses LiFePO4 Lithium Iron Phosphate chemistry, a strong electrolyte capable storing an extraordinary amount of power for up to 10 years. That provides nearly 100% usable capacity powering your trolling motor for the next 3000 fishing trips. 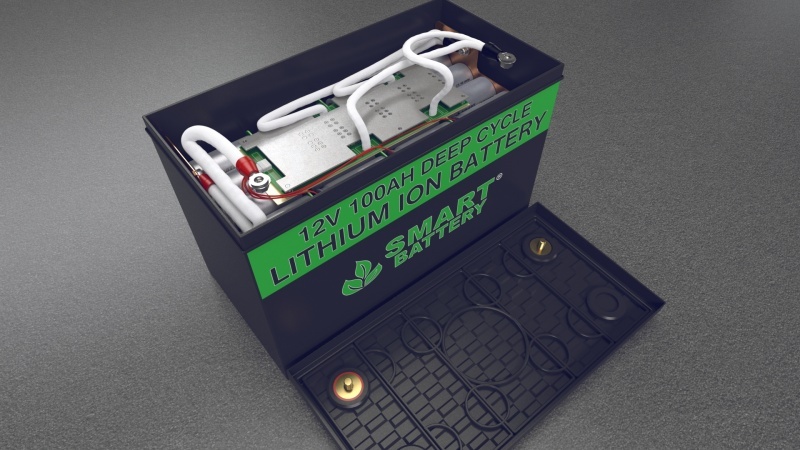 Smart battery provides nearly 100% of its power for your first 2000 fishing trips. Guaranteed to start your engine faster. When you start your motor a heavy load is placed on your battery. 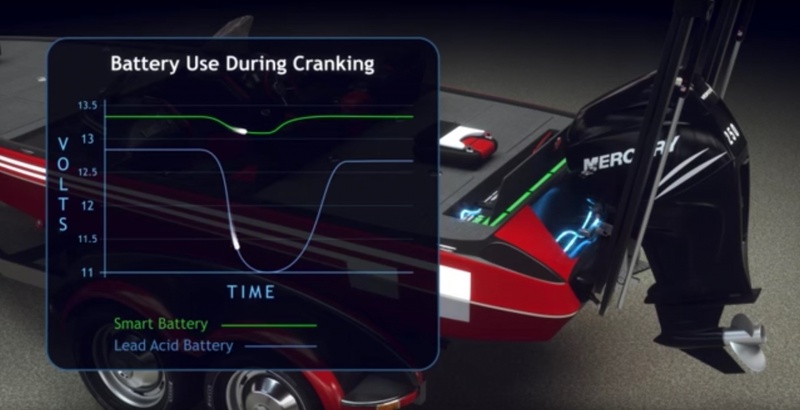 Voltage in lead acid and AGM batteries starts out low and can drop below 10V during cranking causing your motor to spin over slowly. 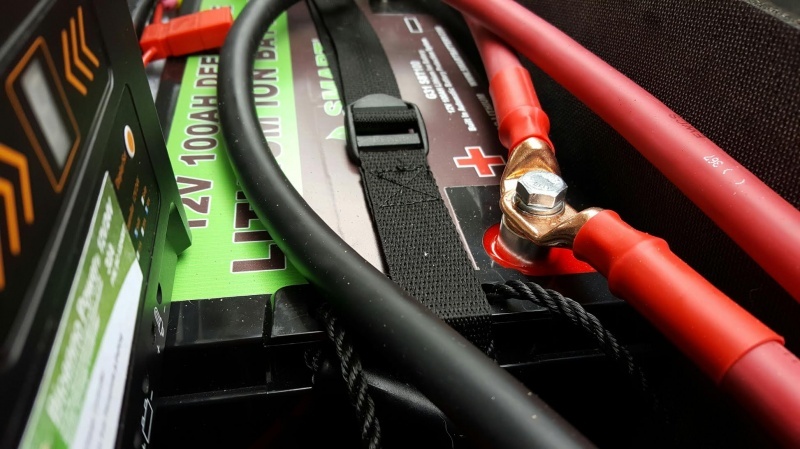 Smart Battery lithium batteries hold a steady voltage above 13V giving your starter all the power it needs to start your engine noticeably faster and stronger. Smart Battery® lithium ion batteries will work with any standard marine charger or alternator. 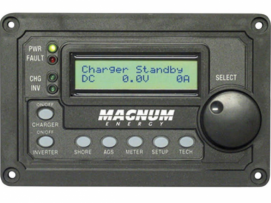 We recommend programming your inverter/charger remote to 14.6V for Bulk and Absorb, and set the Float to 13.6V. Smart Battery® lithium ion batteries can be combined in series to increase voltage or in parallel to increase capacity. The built-in battery protection system independently maintains the cells and keeps the battery operating at its maximum capacity for thousands of cycles. Smart Battery lithium batteries are the same group sizes as Lead Acid Batteries. Simply connect your cables and you're ready to go. The built-in battery protection system will automatically disconnect if you accidentally touch the positive and negative terminal together with a wrench or if the battery is accidentally wired backward. After you install the battery and connect your cables you can immediately use the battery. Unlike other lithium batteries that require sophisticated external wiring to battery management systems, our line of drop-in replacement lithium batteries are " Plug and Play " requiring no maintenance for life. Install once and you are done! Smart Battery lithium batteries work with all standard solar charge controllers. Our batteries are 99.1% efficient and able to absorb nearly 100% of the energy from your solar system whereas your lead batteries can lose over 25% of the power from your solar panels due to resistance. Tip: Keep your battery connections firmly tightened, a loose terminal will heat up and cause resistance. 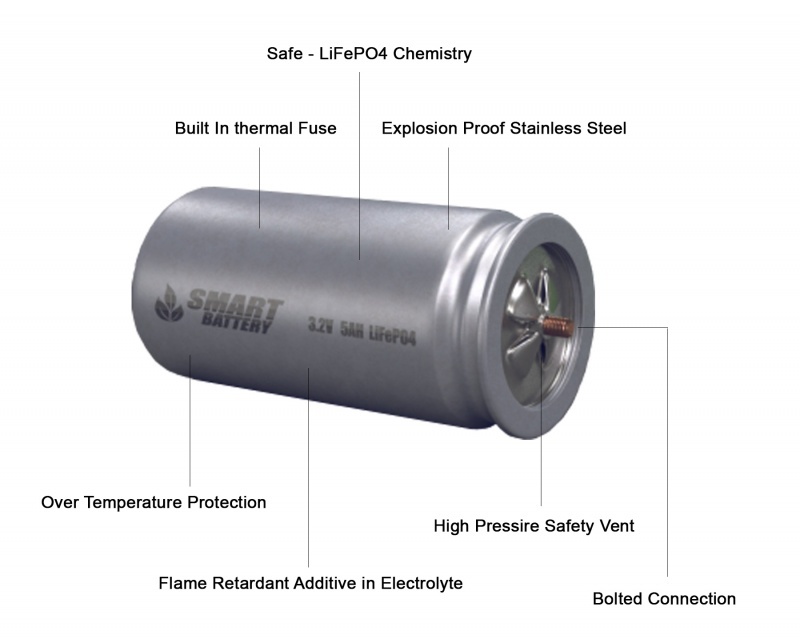 Smart Battery's are manufactured with our 3.2V Lithium Iron Phosphate (LiFePO4) Explosion Proof Stainless Steel Cells. Most Smart Battery cells bolt together for a firm connection and more electrical conductivity compared to the tab welded method. Our cells are among the safest on the planet with multiple redundancy features. Our latest cell technology has a built in thermal safety fuse between the anode and cathode that will internally break in the unlikely event the cell would begin to overheat. A high pressure safety vent will flip open to release energy and prevent explosion if exposed to extreme heat. Our cells are manufactured with a flame retardant additive in the electrolyte making them safe. 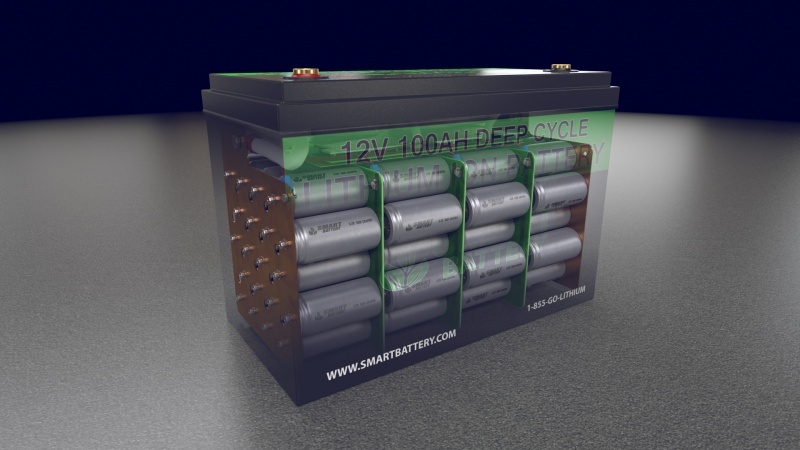 Every Smart Battery cell is manufactured in a explosion proof stainless steel cylindrical case. Contact Smart Battery today and speak to one of our Professional Sales Engineers who will help answer any questions you have.